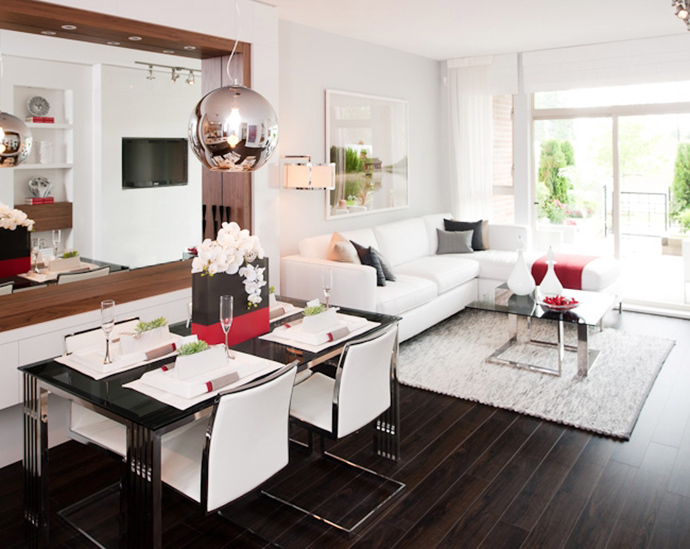 « EXCITING LAUNCH at Burnaby’s CONCORD BRENTWOOD Hillside West Phase 1 Condo Release! Located in the award winning UniverCity SFU Burnaby community, the new Veritas Burnaby Mountain condos and lofts by Polygon will introduce affordable two bedroom homes from just $389,900 plus a fantastic selection of residences under $400,000. The West Coast contemporary architecture of Veritas Burnaby SFU condos is designed by world renowned architectural firm, Ray Letkeman Architects Inc. The project will consist of 2 beautiful and distinct residential buildings that are carefully designed around a landscaped courtyard with a meandering pathway. Each building entry will feature dramatic glazed canopies with timber supports. Located high atop Burnaby Mountain, Veritas by Polygon are carefully crafted to fit a variety of lifestyles and will include loft style floor plans in addition to functional and spacious 1 plus den to two bedroom layouts. The Veritas Burnaby Mountain condo lobby entrances will be impressive with aluminum entry doors, custom wood panels, porcelain tiled flooring and distinctive feature lighting. Amidst world class amenities and stunning natural landscapes, the Polygon Veritas Burnaby condos at UniverCity SFU is within walking distance to many shops, restaurants, cafes and urban conveniences in this master planned community. The development will feature a fully equipped fitness studio in addition to a multi purpose room and lounge. There is underground parking as well as Polygon ‘New Generation’ design and construction for our West Coast climate. The presale Burnaby Veritas condos will also come with the comprehensive warranty protection by Travelers Guarantee Company of Canada. The windows are low E, double glazed and thermally broken and there is hydronic water based in floor radiant heating system. Ground floor units have alarm system wired in and each suite entry door has a heavy deadbolt and door viewer. For more information about Veritas by Polygon, please visit www.polyhomes.com today or you can simply register your interest on this page and we will send you details about upcoming home releases. The distinguished interiors at the new UniverCity SFU Veritas condos on Burnaby Mountain feature rich laminate wood floors in the entry and plush nylon carpeting. There are two designer colour palettes that include Earth and Sky. Decora style rocker light switches, vertical blinds on sliding doors and horizontal blinds on all windows are standard features as are painted wood baseboards throughout the home. The deck or patios are spacious and the rooms are light and airy. The kitchen, living and dining space will also feature warm laminate wood floors. The cabinetry will be either laminate white or wood grain with polished chrome pulls. Special cabinet features at Veritas Burnaby condos include corner cupboards with rotating shelves in most homes. The kitchens will also feature contemporary halogen track lights, triple roll out recycling bin station, premium engineered stone counters with full height glass tiled backsplashes and breakfast bars in most floor plans. The Burnaby Veritas condos at UniverCity will also feature a modern stainless steel appliance package that includes a Frigidaire Energy Star dishwasher with four button clean touch control pad and delay start feature, 17 cubic foot Hisense fridge with exterior controls and LED lighting, Frigidaire slide in electric range and integrated Broan hood fan with light. All kitchens will come with an under mount stainless steel sink, polished chrome faucet with vegetable pull out spray and soft closers to all doors and drawers. The bathrooms at Veritas Burnaby condos will feature designer selected imported ceramic tiled floors, rich flat panel laminate cabinetry with polished chrome hardware, contemporary soaker tub in all suites with ceramic tile tub and shower surrounds, ensuites featuring sleek engineered stone counters with ceramic accent tiles and vanity mirror with contemporary lighting plus floating cabinetry. The second bathrooms (in select homes) will feature glass walk in showers with non slip surface, and some homes will have integrated spa showers and all will have dual flush toilets for water conservation. Added conveniences at the Veritas Burnaby Mountain condos include Samsung full size stacked front loading Energy Star washer and dryer, master bedroom walk in and entry closets, TV outlets, telephone jacks, high speed internet pre-wiring and key fob access to common areas and parkade. Straight from the marketing web site: Rising atop Burnaby Mountain, Veritas by Polygon is a collection of one and two-bedroom modern apartment residences ideally situated for higher learning. Steps from a protected forest renowned for its natural beauty and spectacular views, Veritas Burnaby condos enjoy immediate access to Simon Fraser University – Canada’s top comprehensive university and a setting rich in culture and lifestyle opportunities. Just a stone’s throw away is University High Street – a social hub of the community complete with village-style shopping, restaurants and services. An elementary school, childcare centre and parks are within walking distance, along with a transit terminal served by four major bus routes. For those who commute to downtown Vancouver and other municipalities, SkyTrain’s Millennium Line is conveniently located at the foot of the hill. 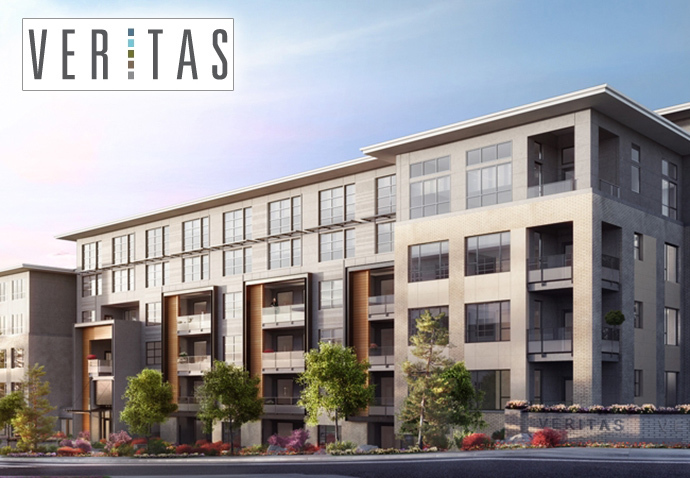 Designed by the acclaimed team at Raymond Letkeman Architects Inc., Veritas Burnaby condos embody the artistry of contemporary West Coast architectural style through the use of large roof overhangs, three-storey wood detailing and extensive brick facades. The community also boasts a large central courtyard and fully equipped fitness studio for residents to enjoy. Inside, the homes feature airy over-height ceilings, spa-inspired ensuites and gourmet kitchens with the latest finishings, assuring a new standard in stylish condo living.